JASH Cast Iron Pallet Sub Tables are used on machining centers as ready fixture plates for tooling up. They allow easy, faster and repetitive set up on machine pallet and reduce change over time thereby minimizing loss of operation time. They also help in protecting the surface of machine pallet and can also be used as sub-plates to provide space for work setting. Made from close grained cast iron conforming to Grade FG: 260 of IS: 210 and having hardness within 180-220 HB (equivalent to GG25 /FT25 /35-A). Higher grades also offered on request. Flatness and parallelity of top and bottom surfaces within 10 microns over 300 mm. Squareness between two abutting sides within 10 microns over 300 mm. Offered in two types viz Hole Type & T-slot Type. 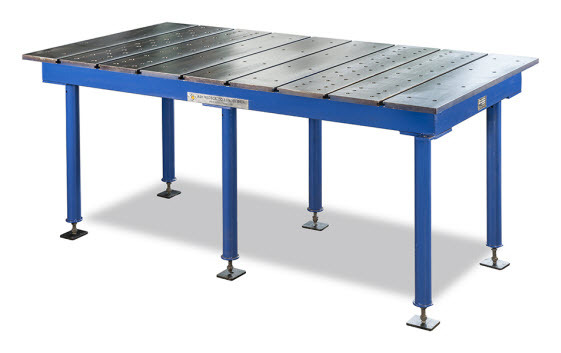 T-slot Type Tables provided with 18H8 T-slots along the length and breadth. These can also be provided with M16 Helicoil steel inserts , if required, at extra cost. Provided with counter bored holes for clamping with machine table. Standard sizes for Horizontal Machining Centers are shown in the table. Other sizes for Vertical Machine Centers, Milling Machines, Boring Machines etc can be offered on request.